I would like to tell you about my grandmother – Boiko Anna. She was born and lives in the village of Yaglush in Rogatyn district of Ivano-Frankivsk Oblast. She is a cheerful, talented, strong person. A person who has been through a lot, who is full of knowledge and memories. This is how Anna Boiko’s granddaughter, Olya Suprun, starts [uk] her blog called “The Story of Anna Boiko's Life.” Online, Olya shares her grandmother’s memories, including stories from the life of their family and other residents of Yaglush. Her grandmother’s native village, Yaglush, is located in today’s Ivano-Frankivsk region of western Ukraine. This region belonged to the Austro-Hungarian Empire since 1772, to West Ukrainian People’s Republic for a short period after World War I, to interwar Poland between the 1920s and the late 1930s, to the Soviet and then Nazi forces during World War II, and then again to the Soviets from 1944 until Ukraine’s independence in 1991. 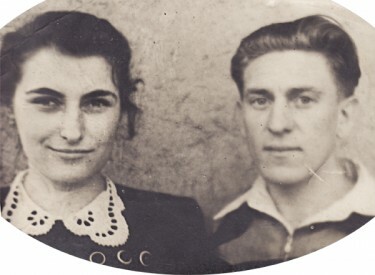 Anna Boiko with her husband Mykhailo. Photo scanned by Olya Suprun, used with permission. Anna Boiko’s memories recorded by her granddaughter go back as early as 1939 and depict the experiences of Yaglush residents during the times of the region's transfer from the Polish to the Soviet rule, the World War II period, and the subsequent return of the Soviet power. They touch on such painful topics of Ukraine’s history as the Nazi occupation, repressions and deportations of the local population during the early years of communism, the fate of the partisans from the Ukrainian Insurgent Army. The things in politics were tremulous, too, [people] were expecting better times than under Poland, but things did not turn for the better. The arrests and prosecutions began. Several families were deported to Siberia: Zakhariy Zliukovsky, Dutka and a few more families that were resettled here from Poland. The landowner’s land was divided up, and [my] mom got a few hundred [square meters]. But the land was of clay soil and inaccessible in the rain – there was no good road. At that time the war with Germans was approaching. I remember it was a Sunday, a bright and sunny day. Grandma was chatting with a neighbor woman in the house. I went to the yard to let the chicken out […]. Suddenly [I heard] a loud roar of thunder – one, then another. I ran to the house and told grandmother, “Grandma, get the hen in, a rainstorm is coming!” Although the sky was clear, without a single cloud and no storm was in sight. Soon mom came home and said she heard in a village that there was a war! It was not thunder, but the sound of bombs falling. From that day on people became very cautious. It was the year of 1941. Despite her grandmother's difficult childhood, Olya portrays her as a knowledgeable yet curious 75-year-old woman, who writes poetry and memoires, does beautiful embroidery, plays computer games and enjoys cooking. She frequently shares Anna’s poems, recipes and stories of everyday village life, while paying special attention to customs and traditions cherished by its residents. 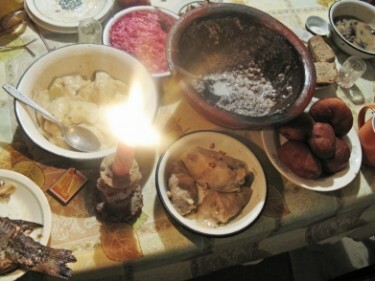 Traditional dishes made by Anna Boiko for the 12-Dish Christmas Eve Dinner. Photo by Olya Suprun, used with permission. 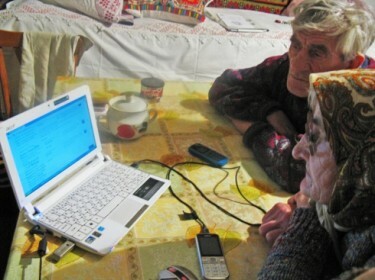 Anna Boiko reads a blog about herself together with her husband. Photo by Olya Suprun, used with permission. It seems, however, that the popularity of The Story of Anna Boiko's Life has already exceeded its author’s expectations. In 2011, it was recognized as the best personal blog at Best Ukrainian Blog Awards [uk], and the number of its readers and fans continues to grow. Thank you for this beautiful post, I hope Anna will be happy to see it has been translated into so many languages – I have just published the Portuguese version. I am very happy to see how many languages the post has been translated into as well! Thank you for your valuable contribution! I really hope the interest this post generated will encourage Olya to keep her wonderful blog going. The fact that history in our country tends to get very politicized makes such first-hand accounts even more precious… I also hope Olya would set some sort of a new trend in Ukrainian blogosphere.